American singer Britney Spears tweeted a video of herself showing off her gymnastics skills in celebration for Los Angeles being awarded the 2028 Olympic Games. In the video, Spears does back tucks, round offs, back handspring and handstand walks. "Fun day yesterday at gymnastics! So excited to hear the Olympics are coming to LA in 2028... already getting in the spirit" she captioned it. It is no secret that Spears is fan of the sport. She has included gymnastics moves in her video clips and on stage-performances throughout her singing career. She also enrolls her sons in gymnastics classes. Days ago, Paris and Los Angeles were confirmed as hosts of 2024 and 2028 Olympics. 2024 will mark the centennial of the 1924 Summer Olympics, which was held in the same city, and was the last time Paris held the Olympic Games. Paris will become the second city to host the Olympics three times (1900,1924 and 2024) after London (1908, 1948 and 2012). Los Angeles has hosted the Olympics twice before in 1932 and 1984. 2028 will be the fifth time the United States has hosted the Olympics with 1904 and 1996 Olympics being held in St Louis and Atlanta respectively. Is Madonna raising a future Olympian? 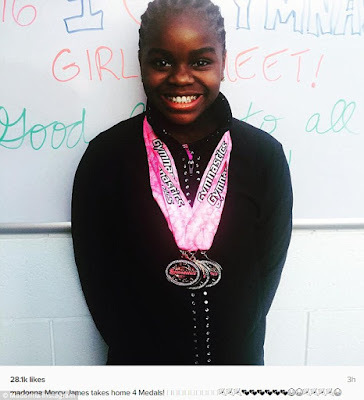 Last week the American singer, 58, posted two photos on Instagram picturing her daughter Mercy James, 10, showing off four medals won at a gymnastics competition. The competition took place on 4 December. Madonna posted a first picture of her proud daughter with her medals, congratulating her on her victory. ‘Mercy James takes home 4 Medals! 🙋🏾🎉💘🎉🙏🏻🙏🏻🎉🎉🎉💕💕💕💕💕💕😂😁🎉🎉🎉🎉😁,’ she wrote below. Madonna adopted Mercy in 2009 from Kondanani Children’s Village in the town of Bvumbwe in Malawi. Mercy was placed in the Children's Village following the death of her teenage mother. 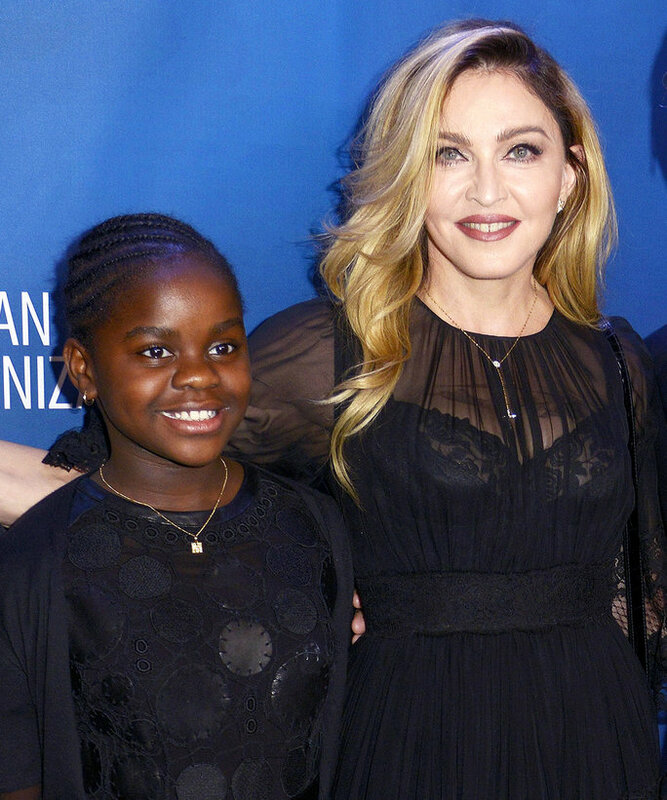 Madonna also adopted a boy, David, now 11, in Malawi in 2006. She also has two biological children, Lourdes, 20, and Rocco, 16. We look forward to learning more about Mercy James’s gymnastics career! Millie Andrilenas is a 17 year old girl who was born in China and adopted at 16 months old by Jim and Minah Andrilenas. Millie was born with a congenital malformation of her left hand. She has only a minimally developed bump of a hand beyond her left wrist bone. But she never used it as an excuse for not living her passion. Millie who has been doing gymnastics since childhood, is the best gymnast at her high school (Juanita). She was an individual qualifier for last year’s 3A/2A state meet in two events: floor and vault. 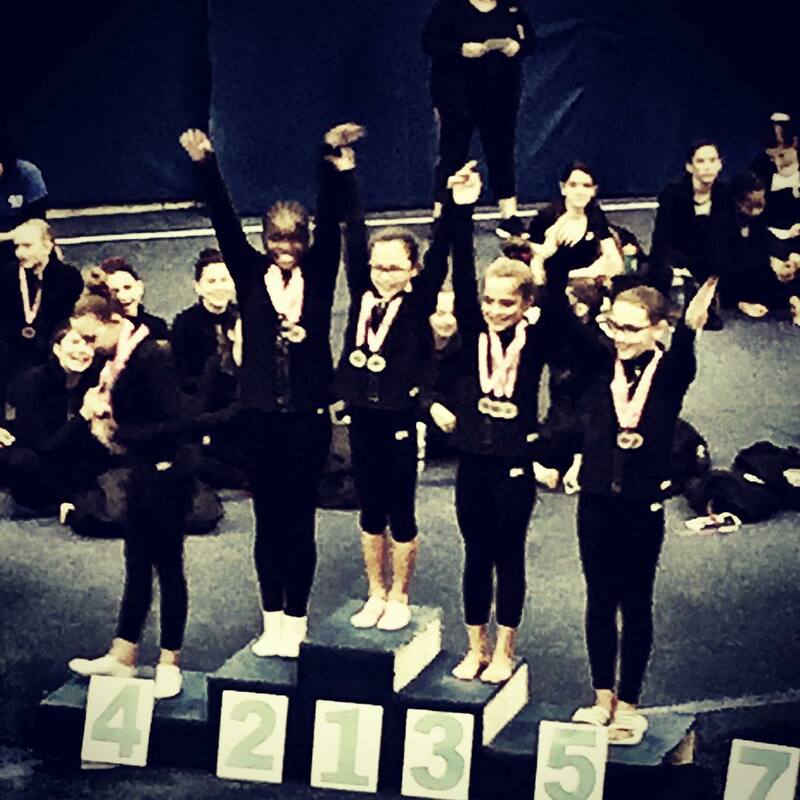 In meets this season she has placed first, second and fourth in all-around. In everyday life, Millie does everything normally like fixing her hair but there are other things which she needs help with like opening a package. Gymnastically, Andrilenas gets her left arm taped from the forearm down to protect her truncated limb. When whirling on uneven bars, she hooks her left elbow on the lower bar to cast herself to the high bar. Beside gymnastics, Millie plays for the school’s soccer team but gymnastics is her one true love. 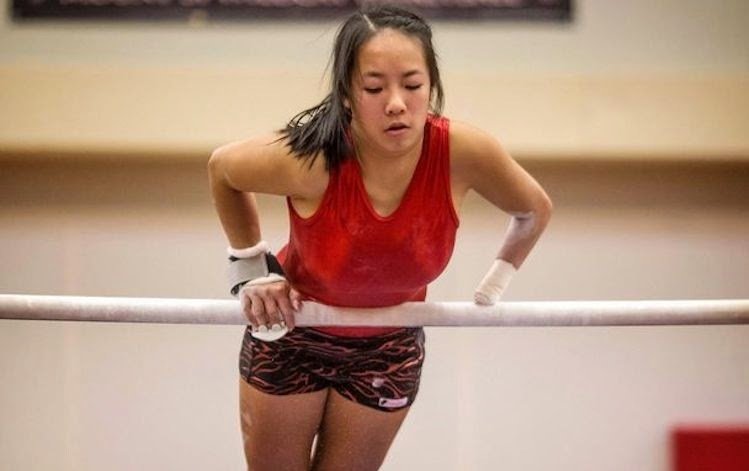 A teenage gymnast sets the perfect example of defying disability. Lola Walters who is 14 year old, is suffering from Nystagmus a condition of involuntary eye movement which causes her in seeing double. But that did not stop her from doing the sport she is most passionate about. Lola is originally from Bulgaria. Her mother Beth who was then 32 year old divorcee was casually researching in international adoption, she discovered Lola’s photo on the orphanage’s website and immediately fell in love with her and decided to adopt her. Lola was not diagnosed with Nystagmus up until she reached the states. Her mother said her vision is very complicated, she can see but what is in front of her is constantly moving which makes it hard to focus and judge distances. Lola started gymnastics at the age of three, she has learned to accommodate the challenges of being a legally blind gymnast. Balance beam, the four inch wide apparatus is considered to be her biggest challenge. “It’s four inches wide – so that’s hard enough for anyone to walk on, let alone jump and flip on, so when I start to see two beams instead of just the one that’s really there I have to steady myself on my feet and really focus.” Lola told the Dailymail. On the other apparatuses, she uses her touch to make up for her inability to tell exactly where to jump or stretch to make contact. But Lola is prone to injuring herself more than any other gymnast. During training, she falls the most and her accidents are more serious than the other gymnasts. Nevertheless, her passion and determination never stops her from doing the thing she loves the most. She even plans on becoming a coach. Thanks to Gabby, Lola got to wear an Olympic gold medal.